Up until about 250 years ago the Sea Otter lived in great abundance along the Pacific coast and around Tofino with numbers ranging in the hundred of thousands. In the 18th and 19th centuries they were nearly hunted to extinction by fur traders. Sea otters rely on their dense fur, among the finest in the world, for insulation in the cold waters of the Pacific Ocean. Male sea otters live between ten and 15 years, while females live slightly longer, to 15-20 years. When not diving for food, sea otters spend most of their time at the surface eating, grooming, resting, or travelling from one preferred area to another. They swim underwater by vertical undulations of the rear body, hind limbs, and tail. Sea otters sleep at sea, sometimes joining hundreds of others in favoured resting areas called "rafts." Sea otters must eat at least 25% of their body weight each day in order to maintain a high metabolic rate, which keeps their internal body temperature at 37C. Sea otters eat bottom-dwelling near-shore animals, which they often forage for in kelp forests. Sea otters eat more than 40 different prey items, but often have certain favourites that they specialise in such as abalone, sea urchins, crabs, clams, and octopus. Sea otters swim on their backs and use their bellies like dinner tables. Sea otters are one of the few animals to use tools. They often use rocks to break open the shells of prey items by either smashing the shell with a rock or by smashing the prey against a rock on their belly. Sometimes, favourite rocks or food items are kept in pouches of skin under the forelegs. Sea otters are considered a keystone species, which means they directly affect the ecosystem in which they live—the kelp forest. Sea otters eat sea urchins and other animals that graze on kelp. Sea urchins are considered the most efficient and destructive consumer of kelp in the state. Sea otters, by eliminating sea urchins, help the kelp forest grow. There are documented studies that show that the removal of sea urchins by sea otters fosters the proliferation of kelps and profoundly alters the composition and dynamics of the kelp forest ecosystem. Enhancement of kelp beds by otters produces substantial enlargement of fish stocks which associate with kelp. The bottom line is that the sea otter is an indicator of a healthy ecosystem. 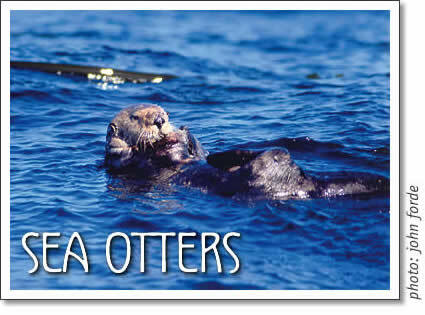 Without the sea otter we will lose our kelp forests and all the biodiversity associated with them.